In the efforts to address poverty, the voices of those impacted by economic insecurity are too often conspicuously absent. The Goldin Institute's work builds on the experiences and perspectives of those living in poverty and designs solutions based on their knowledge, strategies and aspirations. The current debate about the efficacy of microfinance is marked by the absence of those who have most at stake in the controversy: loan recipients. The Goldin Institute is working to lift up these voices, most often marginalized women, and restore their perspectives, insights and aspirations to the discussion. Our strategy for bringing their voices back in was simple: we decided to ask them. We adopted a strategy known as "oral testimony" which relies on extended semi-structured interviews to let participants tell their own stories in their own words, share their opinions and experiences and convey their own understandings of how development and poverty has transformed the history of their lives and villages. We wanted to take this approach a step further. Often oral testimony research is colored by power-dynamics between "researchers" and "subjects". Within these dynamics, answers to questions are often pre-determined by what each party expects to hear from the other. We decided to address this by inviting microcredit recipients in Arampur, a village in rural Northern Bangladesh, to interview each other about their own experiences with loans. We hoped that the content of these interviews would be shaped by mutual dialogue, rather than by top down agendas and expectations about what we, as researchers, wanted to hear. In order to do this, we trained a group of villagers in basic, qualitative research techniques and invited them to interview their peers and neighbors. The result was open-ended, conversation-style interviews, recorded using digital-audio recorders, in which the interviewees participated in directing the discussion by framing conversations through stories, life experiences and their own personal histories with microcredit lending organizations. Using this approach we heard what people had to say about microcredit on their own terms. 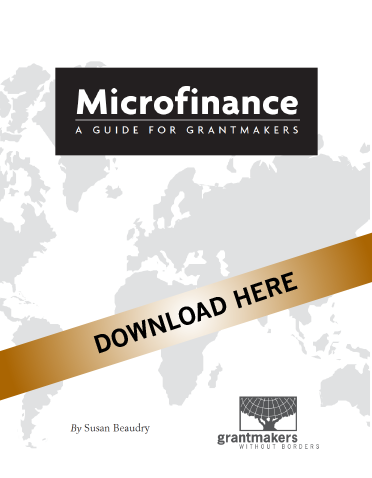 The community researchers themselves were all microcredit loan recipients. They were able to give us early insight into the landscape of credit and poverty within the village. They participated in shaping and revising our research goals to better answer our questions about microcredit, as well as transforming the strategies we employed to accomplish them. 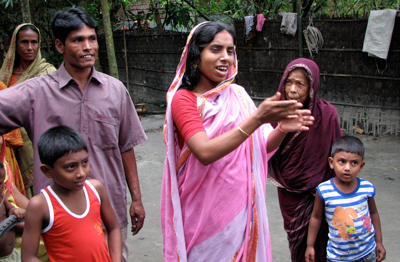 As community members, they understood the best ways to conduct the work within the cultural context of rural Bangladesh. They understood what the best times to approach people were, how to make each interview session as comfortable for respondents as possible, how to best navigate the complexities of rural Bangladeshi household and gender power dynamics, and how to ask probing questions without crossing sensitive lines. Respondents were more comfortable speaking with their neighbors than they would be with a researcher from outside. Respondents did not have to explain taken for granted points. They did not have to couch their language or speaking style to be understandable to an outsider. Further, the semi and unstructured interview strategy allowed the respondents to direct the conversation, steering discussions to what they wished to talk about. Community researchers were better situated to explain and help us interpret stories and experiences as they were shared. They did this by recording audio field notes after every interview and by sharing their stories in daily debriefing sessions. Community researchers were able to elicit different kinds of responses and stories than those we could have gathered on our own. The stories shared by respondents were of a remarkably different kind than those that could or would have been shared with outside researchers. As such, the interviews collected by our fieldworkers contain different kinds of insights, stories, and critiques that shed a new light on microcredit in rural Bangladesh. Community researchers knew their community and therefore knew what questions to ask. They knew their respondents and were able to ask about specific incidents from their lives and histories. They could seek targeted information about their families and livelihoods. They knew the intimate details of cultural, agricultural, and political processes in the village. They were able to ask questions that pertained directly to local practices and histories. Graphic Novel "Still Not Free"